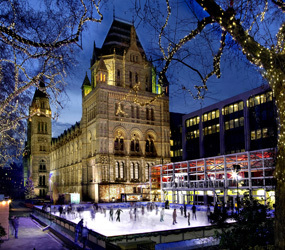 Ice-skating, as described by The National History Museum, London, is ” London’s most spectacular winter attraction”. In my own words its hell, hell on ice. Eventually, however, I was worn down and bowed to their peer pressure. The day was booked, the calendar marked and that fear began to reoccur. It lingered in my final thoughts at night, like flashbacks from a film of a small boy screaming clinging to the barriers for dear life. I shook it off, reminding myself that I was young, foolish and unbalanced (literally) back then, yet it still remained. You may feel at this point that I’m over exaggerating for dramatic effect, but let me assure you I am really not. The fear was real and not unfounded. The day rolled round and we made our way to our doom. Doom easily accessed by public transport. Seeing small children and doddery old ladies slink elegantly around the rink gave me a glimmer of hope that perhaps I was being bonkers in fearing this. We soon made our way into the queue and I traded my shoes in for bladed bowling shoes, shuddering at the thought of the plethora of other people who have shifted and sweated within them. Once the clasps were secured and my previous shoes disappeared around the corner there was no turning back. Standing up for the first time on them felt odd but not bad and the feeling of ‘perhaps I can do this’ began to rise, before being cruelly smashed when I boarded the ice. We waited ‘patiently’, shuffling our way towards the unopened doors like bulls preparing for the Pamplona, while what can only be described as a freezer on wheels went around refreezing the rink and making it slippery once more. I took one more moment to pre-warn my friends that I had a bad feeling about this and then we were on…. 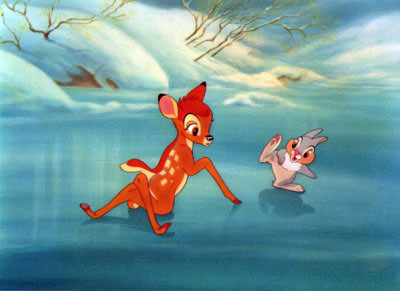 If anyone has seen the film Bambi, when the title character finds himself on the ice and his limbs shift irrespective of the other, balance becoming lost in a frozen moment, will know exactly how I was on the ice. While I floundered and fell my friends found the balance fast and were off zooming annoyingly gracefully into the distance. 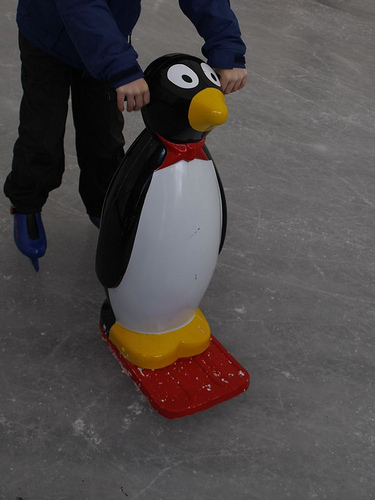 The small children were allowed to use Pingo shaped stabilisers (see photo). I envied them immensely as they sailed around with their penguin protectors. I’m not proud to admit that I sheepishly asked the stewards if they had larger versions (carefully omitting the word ‘adult’, as clearly nothing about my panicked state was adult like). I spend the majority of the time with an iron grip around my friends’ hands or linking arm in arm with my two male friends, which more than once resulted in a fellow skater “aww”ing at us. The hour seemed eternal, time frozen like the rink. Again I’m not proud to say that I called time on my skating sorrows early and consoled myself with a stiff coffee (sadly there was nothing stronger within reach). So while the whole sorrowful event wasn’t big on dignity, it was big on humour for you the reader and for anyone who was ‘lucky’ enough to witness it. Oh the horror of it all. I could just visualise all this as I read along. I know its no comfort to you, but I would be exactly the same. Takes me all my time to keep upright sometimes when moving with just ordinary shoes on. At least you made the effort. haha good advice! I had one experience of black ice a few years back walking my dog, we both ended up on the floor. Seriously undignified! ouch… yeah, I had a solo experience on Fifth Avenue in NY, outside of Bergdorf Goodman. Definitely undignified. I learned. Ah ouch! At least I was on a country lane the only one to witness it was the dog. The one time I tried it, I was too numb and focused on staying upright to know whether I had a good time of it or not. My fingers and toes simply ached nay throbbed from the cold and my muscles were screaming from trying to hold it all together. hmm..in retrospect, I cannot see how I could have enjoyed it with all that going on. hehehehe.. I am NEVER doing it again! !